Richards Parish Walk Blog: 27th May 2011. Less than a calendar month to go, four weeks exactly come eight a.m tomorrow morning. I'm taking it easy before monday although doing nothing makes me feel bloaty and weak as I can imagine all bits of my body gradually shutting down and failing. I'm not normally this nervous before races but a friend who works in London recieved a tourist leaflet promoting bank holiday weekend events and the Mall 20k race walk was somewhere in the middle, "go along and watch the athletes warming up for the olympics on the Olympic course, free to watch" said the slogan. The Parish is unique in the UK as pretty much everyone watches the race at some point giving it a spectator count of tens of thousands in total along the whole route, while race walking in the UK is slightly less popular, one 10k race I was in during the winter doubled its spectator count from last year when the bloke brought his dog! This is going to be watched by people expecting proper olympic walkers, not me, gasping and wheezing at the back. I had Robbie Callister in my sights, pushed on up Ballakillowey, and at the bottom of the sloc could see Jock halfway up and the others dotted at distances behind him so I wasn’t far behind. When Pauline eventually got to me, I think she had bummed a lift in Robbie’s back up car, she explained what had happened, gave me a drink, and then went off to get Helen’s car which was in Peel then try and catch up with me again. Unfortunately, the one way system on the sloc put in place to protect the walkers meant that she had to drive around the south of the Island to get my gear from Rushen and the broken car, a long and arduous task. I should have eased back, saved energy and lowered my heart rate to ready myself for the intermittent supply line, but felt I was strong enough to go on at speed. It was to come back to me later when dehydration meant I never really recovered after Peel, although thanks to my warm weather training I'd done I wasn't in as bad a condition as I could have been. It was strange on the sloc at that time, Manx radio was reporting on hundreds of walkers, but there were few cars on the sloc itself, eerily quiet. It was a little misty on the lower sloc which kept it cooler, by the time the main bunch of walkers had got onto the climb that had cleared. Towards Ballaugh I was struggling, despite eating some soup and drinking plenty of water once Pauline had sorted things out. My pulse was up to 170 even though I was taking it steady. My walking style suffered as I lost concentration, and by Jurby my right heel started to blister, right in the middle on the bottom of the heel. Speaking to Richard Gerrard afterwards, he said he passed me and I seemed in a semi daze. I certainly don’t remember him passing me. It was hot, Pauline had got me a tea towel and soaked it to put around my neck and I carried on taking on liquids. By this time I was limping as the blister on my heel was spreading. Slowly but steadily. At Bride towards evening it cooled down, and the wind was in our faces. 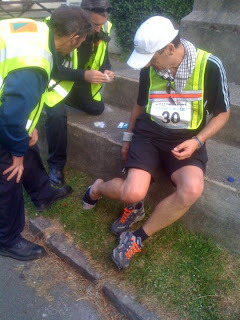 I started to recover from the dehydration but was now struggling with my heel, still limping, and approaching Lazayre the blister spread enough so that it was against the hard skin at the back of my heel which was quite painful. I was even contemplating stopping. I was now seventh, and walking slower, with walkers behind catching up. At Lazayre, Pauline got me a pot of cold fresh fruit, water melon, peaches, apple and berries, which was a great help, some painkillers eased the foot a little, and at Lezayre itself, Robbie was sat watching the world go by in the evening sunlight. “Just giving you as head start…” he replied with a smile. It was the incentive I needed. I was sixth again, I could live with that, and with renewed confidence I pushed on. On the climb up to Maughold I was escorted by Pauline, Helen had joined us in her friends car, and Liz Corran was also showing concern, despite having a whole race to keep an eye on. I was met at Maughold by a warm cup of tea and a medical team from the coastguard who had heard an appeal on the radio for medical assistance as I was limping quite noticeably. The blister was deep under the skin on the base of the heel, and sitting down twisted with my foot in the air was not at all comfortable with rapidly cooling down muscles cramping up. It couldn’t be lanced as it was too deep, a recurrence of the original deep blister from 2007, and any attempt to wrap it up was proving pointless. A watcher pointed out that the man behind me was coming up the hill and was about 5 minutes behind, so to keep my sixth place, I slapped a handful of Vaseline on the heel, took some more painkillers, a large gulp of tea and off I went. I’d like to say thanks to the brave men of the coastguard who probably had their toughest assignment in years in even approaching my sweaty feet after walking 67 miles. Without breathing apparatus or radioactive protection suits. The next few hours went in a blur, just limping to stay in sixth, once again falling into my trap of defending the place I’ve got instead of trying to gain places, but this time I had good reason. At the Liverpool Arms I knew it was an hour to go, and as it was before midnight, I knew at least a seventeen hour/5mph finish was possible, despite the ten or fifteen minute stop at Maughold. Helen had gone on to watch the finish, and told Pauline that my 79 year old Dad had come to watch me finish, which gave me an added spur. I got my sixth place, sub 17 hours, 16h 51m 34s, partly pleased, partly disappointed. But I’d crossed the line, which is very Parish walker’s first target. Get over the line. Sky tv kindly went down to 6th to fit me in. When you get over the line, get your hands around that hot cuppa knowing the months of training have paid off and you've acheived your personal goal, have no more walking to do for the foreseeable future, can have a pint and a kebab without guilt, and are going to get that finishers trophy to remind you of what you've achieved every time you look at it sitting on the shelf, it's a feeling that can't be described. 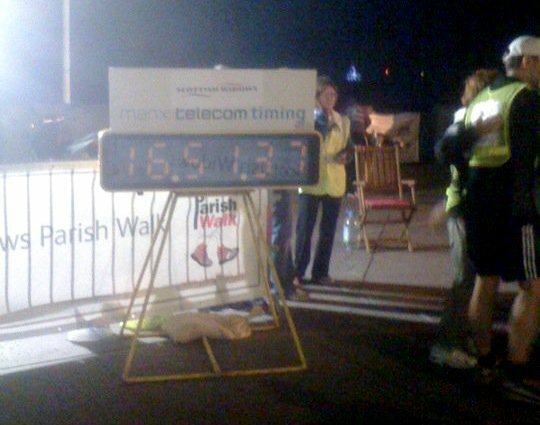 When I did my first Parish, I finished in 21 hours 30 minutes and 7 seconds. That was going to be it, I'd been there, done it, got the t-shirt. I'd actually muttered the parish walkers promise of "never again" on crossing the line. Later, when I could finally walk again, I calculated that I'd done it at 3.85mph, and 4mph was 21h 15 mins, which got me thinking, could I have been any faster? They say the Parish is like having a baby, when the pain, agony and injuries have all gone, then you want to do it again. My second, the joint finish with Michael Bonney, was next, 20h 7mins. Yes, obviously, We were seven minutes from a sub 20 hours finish. If we had finished 8 minutes earlier then maybe I wouldn't have done it again, but a finish time with a 1 at the start was calling. 15th place in my third knowing things had gone wrong and I could do better, and last year I looked at my race and realised a 16 hour race is possible which is why I'm back. I've checked my holidays for next year and see I have June off, so maybe that'll be my last, I have to move on and do something else. Finishing the Parish has been a springboard for me, from couch potato to looking for new challenges. Wainwrights coast to coast first, I have a few friends who are up for that one, then lands end to John o groats, a month off to make it happen. 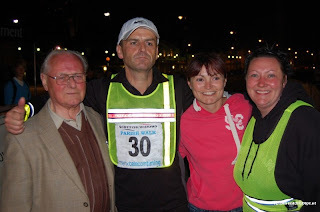 A friend of mine is involved in the windemere relay tonight, a team doing over 200 km along the length of windemere non stop for four days to break the world record. I've always fancied the idea of swimming the channel. The number of times I've taken a ship through the dover straits whilst attempts have been going on. In reality, these would have been daunting targets before 2007, but I now think, if I can walk 85 miles in under 17 hours, why can't I do anything?